Tom Moran’s trademarks include a superb eye for Tonkin cane and his own famous handmade Moran snake guides. 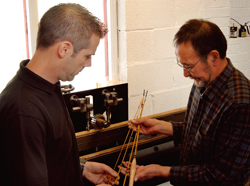 Moran will work alongside Hardy & Greys’ current cane rod builder, Calum Gladstone. Letterman: "I Got a Touch of the Whirling Disease"